Amazon to Apple: Oh, it is sooo ON!!! 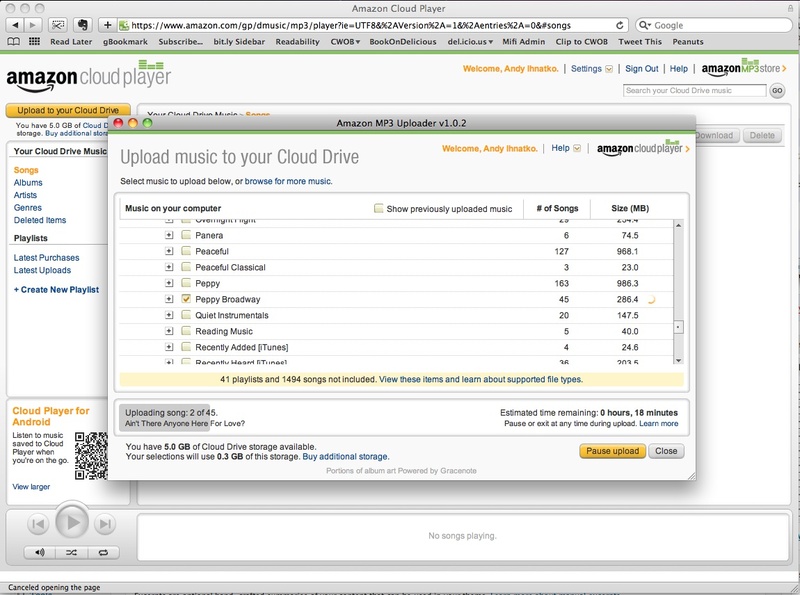 Screenshot of Amazon.com browser window, showing the CloudPlayer; foreground window is the Amazon MP3 Uploader, copying iTunes playlists into Amazon CloudDrive. This is why I love my job. 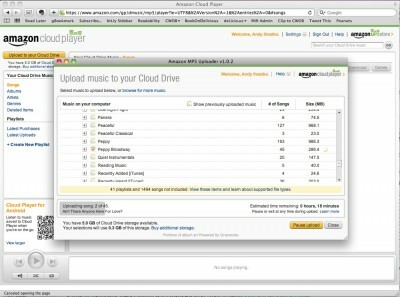 Today, Amazon enabled two new features to their site: Amazon Cloud Player and Amazon Cloud Drive. Cloud Drive is iDisk via Amazon storage, pretty much. You get 5 gigs of storage for free and can buy more as you need it. Your Cloud Drive can store anything…documents, photos, movies, music. Cloud Player…lets you stream all of the music you’ve stored on your Cloud Drive. Annnnd everything you purchase via Amazon MP3 (from now on, anyway) is automatically added to your Cloud Drive and doesn’t count towards your storage limit. If you buy 100 gigs of Amazon MP3, you can play all of it for free without paying a dime. In fact, if you buy MP3s from Amazon, they’ll up your “regular” storage to 20 gigs anyway. And there’s a helper app that’ll scan your existing iTunes library for music files that are compatible with the service. Click a button and all of it — or selected playlists — get uploaded to your Cloud Drive…even files you didn’t purchase through Amazon MP3. 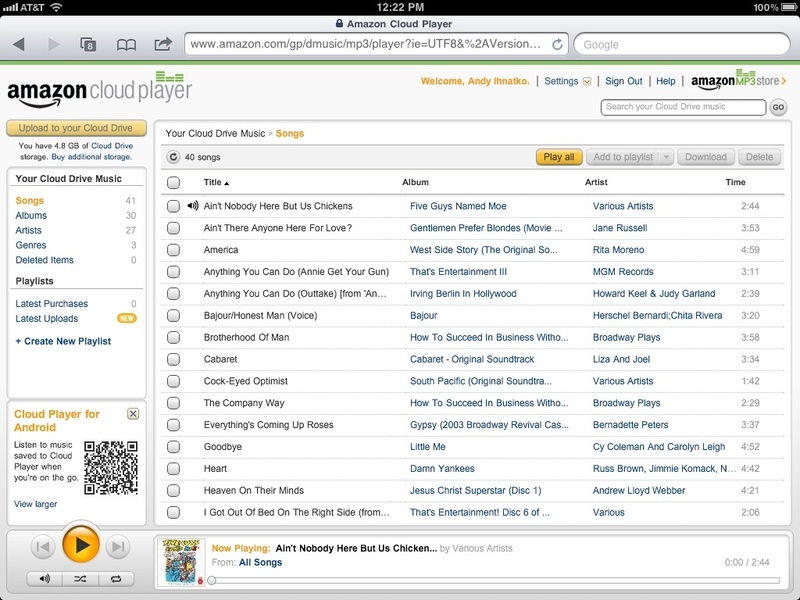 The Cloud Player works through any web browser that supports Adobe Air. So: your Mac is in the club…but your iOS devices are out. But good news if you have an Android phone: the Amazon MP3 app will stream alllllll of your content just great. The Amazon MP3 app for Android devices...all of the music I've put into my CloudDrive is streamable. Even the stuff I didn't buy from Amazon! I’ve already transferred four gigs of music to the cloud and yup, it works great. Any computer, anywhere there’s Internet, I get an iPod Nano’s worth of music. I’ve also downloaded the new Amazon MP3 app to my Android phone and…yup…there’s my music. I tried opening the webplayer on my iPad and it warned me that I’ve got the wrong kind of browser. The player loads up, I can see my music, I can tap a Play button, it selects the track…but nothing happens. 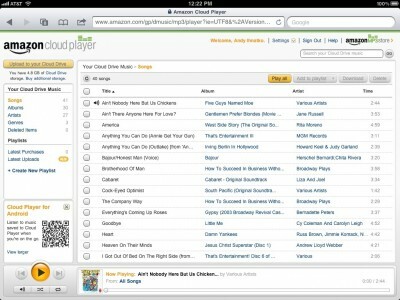 You can visit your Cloud Player on the iPad, and it looks like it could be playing your music...but nothing will play. It seems to require Adobe Air/Flash. Well, isn’t this very interesting! I wrote a column last week about the new Amazon AppStore and how this signaled a start to some more direct and aggressive competition between Amazon and Apple as the elite seller of digital content and as the Great and Powerful Oz of your mobile experience. This is the second shoe to drop in that battle and there’s a centipede’s worth yet to come. I’ve used this service for just a half an hour but yes, I already like it a lot. It’s a much simpler and more robust way to cloud-stream your online music purchases than anything else going at the moment. It’s a reason why I’ll continue to buy music from Amazon instead of iTunes. And — God help me — it makes all Android phones that much more cool. I’ve sent an email off to Amazon about any plans for an iOS player. I reckon they’ll make one if Apple will let them release it. Amazon’s always been about selling content, not operating systems and hardware and it’s always benefitted them to get the Kindle reader on as many devices as they can. I actually first heard about this when I hit Amazon.com to buy a couple of things an hour ago. As soon as I saw it, and I set to work downloading things and uploading things and playing with it, I had to stop and think “Damn…I love my job. Apple versus Amazon is like Ali versus Frasier. This is two evenly-matched fighters and the outcome of their battle can only benefit consumers. This is what I’ve been hoping for: a company with the skill, vision, clarity, and competence to truly compete with Apple. It wasn’t going to be Google. It was never going to be Google. I’m grinning at the thought of how high these two companies can push each other. What a great time to be a geek and to be alive. I think Andy has gone a bit Scoble on this one; a nice shiny new distraction caught in the right beam of sunshine will apparently change worlds. I just can’t see it. I’ve read the article and the comments (usual sincere an intelligent and not standard forum fuff) and read other info on it, and thought hard, but there just isn’t enough to either meet a desperate need or do something I already do light-miles better. Sure, iPod, Kinect and iPad all were examples of successfully stella products overcoming so many pre-release doubts, but each of those were very natural and offered clear Everyman benefits from the moment you saw or touched one for the first time. Using this leaves too many questions. I may be wrong but I feel that this stuff is just more … stuff. This is why the FCC have to say NO! To AT&T and TMobile merge. You’re at a friends house and have a sudden urge to share some album or song with them. The problem is you haven’t included that particular album in your normal iphone/android/whatever sync because you listen to it infrequently and didn’t want to take up space you could use for one more app (for some never an issue for many of us iPhone storage space is a hot commodity.) Cloudplayer theoretically makes this a non-issue as it would let me login to my amazon account and have direct access to that music from my friends computer, or any computer. Personally I think that is a much greater boon than streaming to my iphone (well theoretically streaming to my iPhone), particularly given the bandwidth caps so many have already brought up. Also it is worth noting, at least for the first 5 gigs this is completely free, particularly relevant to amazon MP3 purchases from hear on out. It doesn’t mean you won’t still want local copies of your music it just means you won’t have to have local copies of ALL your music. That said the current 5 gigs of free space is clearly not sufficient for the scenario I just mentioned but with competition storage will only get cheaper and larger and quality will only get better. I’m surprised by the number of people of don’t “get” the appeal or value of this service. While I understand that my particular situation (a 154 gig music library) is far removed from the average music listener, I still find it hard to believe that people find it easy to carry “all” the music they wish to listen to on their iPhone/smartphone. With all the amazing things these devices can do, its a constant trade off between app space (5 gigs), music (15 gigs), videos (6 gigs), photos (2 gigs) and leaving a few gigs free for an impromptu HD video capture/photo session or two. For those who talk about bandwidth or the lack thereof, I feel your pain. Although I enjoy excellent bandwidth in my corner of Canada, I’ll never see the light of this service anytime soon judging by the lack of Amazon mp3 sales here (4 years after the launch in the U.S.). This doesn’t mean I think the service stinks or has no value because I cannot personally make use of it. Whats not to get about this service though, its free (for 5 gig) for crying out loud! (other than bandwidth charges of course) And it automatically backs up all your Amazon mp3 purchases, I know that I would use it if I could. First off, 20gigs is just not enough. The whole point of these things is to avoid copying it all to your iPhone. Most the people that want this, want it for their 100gig library (and don’t want to buy another 100gigs of music from Amazon). Second, so you’re in the other room of your house, or mowing your lawn and want to stream something? (It’s possibly one of the most common uses, based on my experience). This goes not from a local computer with your library, but through the cloud from Amazon, even with your library on the same local wifi network? I don’t know (yet) what bitrate they stream in, but I doubt they transcode for slower connections, meaning the streaming bitrate may not be as high as it would/should be over your own local network. Third, most people with large music library tend to meticulously categorize, rate, organize, etc. their collection. The problem with doing that in the cloud is that a) it’s clunky usually and b) you don’t have the changes locally in YOUR iTunes library. Maybe they’ll address this by having a way to very easily (ie, without reupload) sync playcounts, skip counts, last played dates, smart playlists, etc. I doubt it though. So maybe this is a service for “the rest of people” (it could very well be) but for I’d say the vast majority of MY current customers, it’s not going to be a silver bullet. Which is too bad, I’d love to see someone do it right. Apple perhaps? Will people use it and like it though? Absolutely, it’s free, and (other than no iOS client yet) it “just works”. Which is 2 strikes against me! Just tried it and it fails at first test. Uploading a couple of PDF files (from my Mac using Safari), it stripped the names and left me with the .pdf extension only! Google Documents looks a better bet at this stage. It appears that Amazon is simply *blocking* MobileSafari from using Cloud Player, which should probably be pointed out since it’s certainly something Apple would get called out on. However, there’s a way around this for jailbroken phones. Just use UA Faker to change the MobileSafari user agent to Google Chrome. Then, Cloud Player works just fine. Minor correction: Listed in Cydia as “User Agent Faker,” with available SBSettings toggle (to easily switch back and forth between real and faked user agent string) in which it’s referred to as UAFaker. Did you expect the huge wave of indifference? I know I’m indifferent to the service, but thought I might just be an old poop. 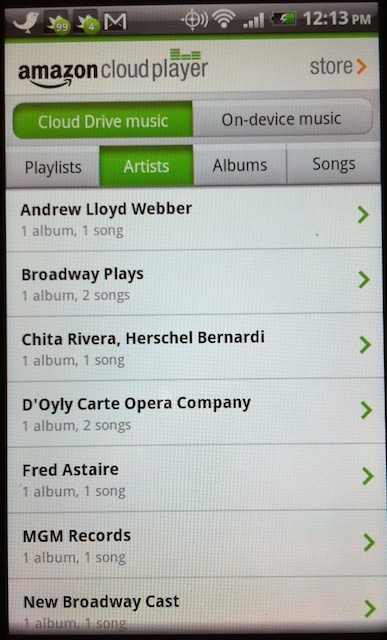 I too have all the music I need on my iPhone, so that even in the 3G void I can still hear my tunes. Streaming services seem so much less worthy of another subscription payment than cloud backup. The MBW conversation Tuesday and your CD sales comment confirmed it for me; Amazon’s stab is newsworthy, but of lasting importance only to heavy duty music consumers. 2) There is no API that us developers can use to make the system work on say iOS, or OS X (the browser interface for uploading 1000 files does not cut it), linux, chrome, google docs, ford, honda, etc etc. I guess they might release one in the future. 3) Uploaded files other than music have about as much functionality as Windows 95. You see tiny icons, have no search, and can’t locate things how we do it on the mac – with realistic icons, etc. 4) No way to use it for a company, etc. No collaboration tools. 5) Feature – music bought on Amazon is free to store. I think that the biggest problem is #2. If you look at ‘raw’ S3 – you can access it with hundreds of clients. Etc. But there are some problems for ‘regular people’ in using S3 as it is – it also has no icons, its harder to set up, etc. The solution to these problems with S3 comes not in building an opaque layer on top of it – like Dropbox and Cloud Drive have done, but rather in using the format that is there – that tools like Cyberduck, Transmit, Amazon’s S3 Console, and others use. These tools allow third parties the ability to upload and download from an S3 account (with your permission) things like archived emails, tweets, image services, etc etc. Our Spot Documents service builds on the open platform that is S3. It indexes and creates nice previews to create a desktop like experience on the Mac, iOS and Web. You can get an idea of how much nicer it is with previews by going to https://client.spotdocuments.com/ and clicking the “Test Drive” button. The iOS client is free to download and peruse the same sample files. S3 is an open API. It is like deciding on a hard drive disk format for the internet. We need a hard drive format for the internet. It’s almost here, but cloud drive looks, at least for now to be a step in the wrong direction. The Cloud Craze aside, there’s a reason Apple still makes the iPod Classic. I’ve ripped my disks as Apple Lossless, and the large files fit nicely on the Classic’s (gasp!) hard drive. In fact I’m hoping they up the drive size at some point so I can upgrade. For me, the ToS is a killer. Amazon is claiming the rights to your files basically, and I certainly wouldn’t be shocked if they were running scans on the files to look for infringing content as part of their attempt to fend off the music industry. Read it. Its MUCH worse than the ToS from either DropBox or mSpot say, which don’t claim anything about YOUR files. I think I’ll stay away other than letting Amazon sideload anything I happen to buy there. Still, a good thing to have this out there. @Maurice Tremblay I understand Canadians rose up to protest a law that would have mandated bandwidth caps. Good for you/us! (Canadian-born). Anyway, if you think the Amazon service is great, I’m not here to convince you otherwise, but yours seems to me to be a classic case of why it’s no big deal. You have 145 GB of music that you may forget to sync at all times. But with Amazon’s current service, unless you buy *everything* from Amazon (which admittedly is usually the cheapest price around), you’ll still have to remember to upload/sync. And you’ll have to pay a yearly fee for all the extra storage it would take to house your entire music catalogue. Looks like you’d need the 200 GB at $200 *per year*. Wow. I wouldn’t go for it. Even the 5 free gigs, while nice, basically amount to having an iPod nano with me at all times. You could practically slip that thing in your wallet. Okay, maybe not. But you could wear it on your wrist. Sorry about the misspelling, I’m still getting used to is iPad keyboard. Cloud streaming assumes a good connection to the cloud. Cellular is not there yet. Public WiFi is often so over crowded I cannot tell you how often the bandwidth is often constricted to something slower than old dial-up speeds, less than 56k. And everyone else has already mentioned the better model for home use, with fast assumedly faster broadband and wifi- local streaming could not help but be faster.